In a rough 2018 for the markets, eBay (NASDAQ:EBAY) had a worse year. The shares pretty much tracked the Nasdaq Composite index from January through June, then fell off. EBAY stock lost 28% versus for the year versus the index’s 6.09% decline. That’s a huge, and surprising, difference. Consider that eBay doesn’t have a stretched balance sheet that would amplify investor concerns: net debt is close to zero. Generally speaking, this has been a stable business — not the type that one would expect to underpin a stock that has lost so much of its value. So what’s going on here? There are two possible answers. Which one an investor chooses will frame his or her outlook toward eBay stock. One possible answer is that the market simply let eBay stock fall too far. Of late, this is the argument I’ve made. In August, I argued investors should stay the course with EBAY at $34. Last month, I called the stock one 2018’s 15 market losers that would be stocks to buy in 2019. The case here is reasonably simple: eBay stock simply is too cheap. It trades at just 12.2x the midpoint of 2018 guidance. The multiple to 2019 consensus estimates is even lower, at 11x. Those multiples essentially argue that eBay’s growth is finished. That in turn seems far too conservative since eBay continues to drive growth across the board. So far this year, revenue has risen 9%. Marketplace transaction revenues have grown 8%+ YTD, and increased 6% in Q3. Ticket reseller StubHub is up 7%+ through the first three quarters after similarly growing 6% in the third quarter. Marketing services revenues were growing double-digits before (again) 6% growth last quarter. The number of buyers is rising. GMV (gross merchandise volume) is rising. Activity on eBay is headed in the right direction- – and yet investors are acting as if that growth has stalled, or is headed for a decline. That seems too conservative. Even the macro risks that have spooked the market don’t necessarily support that kind of pessimism. In 2009, at the nadir of the financial crisis, eBay’s revenue grew 2%, and adjusted EPS dropped just 7%. To be sure, Bay is a more mature business now, and would likely see some impact from a macro slowdown. But there’s also an argument that the company could benefit from market share gains, as consumers look to save money by buying used products or look to make money by selling wares purchased new during better times. So the case for upside in the EBAY stock price is reasonably simple. If growth stalls out, eBay is ‘dead money’ — but would seem unlikely to post more in the way of losses. The business still throws off a ton of cash, and eBay has some $9 billion in cash and investments on its balance sheet. The company repurchased $1 billion in shares in the third quarter alone, and continues to do so. Conversely, the company could de-risk, paying down debt that comes due over the next few years (instead of refinancing) and lowering interest expense, helping earnings and free cash flow. The shift away from PayPal (NASDAQ:PYPL) to Dutch provider Adyen (OTCMKTS:ADYYF) should help earnings going forward as well. Even if growth stalls out — and it hasn’t yet — eBay should be able to create value through cost savings, buybacks, M&A, or some combination of the three. As such, the EBAY stock price seems to be pricing in an exceedingly negative outcome. There is a negative scenario that can play out, however, and one investors need to watch closely. Competitors are coming for eBay. The company established a monopoly in online auctions, forcing Yahoo! (now owned by Verizon Communications (NYSE:VZ)) and other smaller competitors out of the business. But as the business has moved toward a more fixed-price model, two giants are trying to take share. The first is Walmart (NYSE:WMT), whose Marketplace is a piece of its larger omnichannel strategy. The second is Amazon.com (NASDAQ:AMZN). 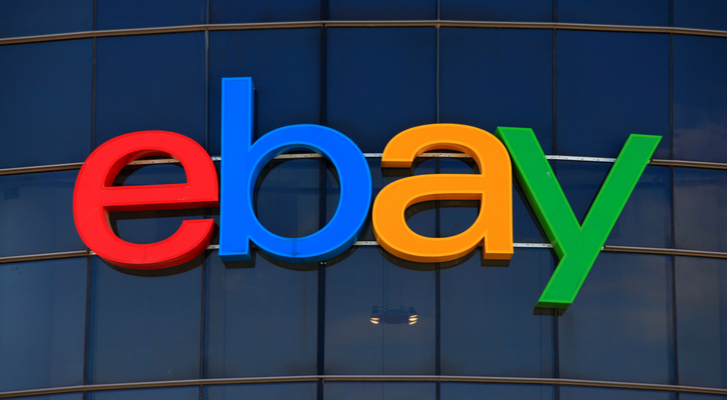 It’s likely competitive risks are responsible for at least a good chunk of the decline in eBay stock over the past 11 months and there are reasons to be worried. Most notably, Amazon cut its fees for sellers last month. The cuts seem most focused on lower-priced items — the kind where eBay traditionally has had an advantage — where Amazon’s supply chain capabilities could give it an edge. If those cuts are just the beginning, and Amazon is looking to take share from eBay, that could start a war that eBay probably can’t win. Investors have given Amazon so much leeway over the years that AMZN stock won’t be punished by such efforts. EBAY stock surely will. For now, I still believe EBAY stock is too cheap. But the competitive risk has to be understood. Growth in merchandise volume is unlikely to accelerate. If eBay has to cut pricing, revenue and profits head south – and even a stock price at a 30-month low turns out to be too expensive. I expect eBay will manage competition well — but any investor going long the stock needs to watch the environment closely, and be prepared to exit if signs of trouble emerge. Article printed from InvestorPlace Media, https://investorplace.com/2019/01/ebay-stock-price-cheap-watch-competition/.